"I-20" redirects here. For other uses, see I-20 (disambiguation). Interstate 20 (I‑20) is a major east–west Interstate Highway in the Southern United States. I‑20 runs 1,535 miles (2,470 km) beginning near Kent, Texas, at I-10 to Florence, South Carolina, at I-95. Between Texas and South Carolina, I‑20 runs through northern Louisiana, Mississippi, Alabama, and Georgia. The major cities that I-20 connects to includes (from west to east) Fort Worth, Texas; Dallas, Texas; Shreveport, Louisiana; Jackson, Mississippi; Birmingham, Alabama; Atlanta, Georgia; Augusta, Georgia; and Columbia, South Carolina. From its terminus at I‑95, the highway continues about 2 miles (3.2 km) eastward into the city of Florence as Business Spur 20. I-20 begins 10 miles (16 km) east of Kent at a fork with I-10. From there, the highway travels east-northeastward through Odessa, Midland, and Abilene before turning eastward towards Dallas/Fort Worth. The La Entrada al Pacifico corridor runs along I-20 between U.S. Route 385 (US 385) and Farm to Market Road 1788 (FM 1788). Between Monahans and I-10, I-20 has an 80 miles per hour (130 km/h) speed limit. From the highway's opening in the 1960s through 1971, I-20 originally went through the heart of the Metroplex via the Dallas-Fort Worth Turnpike. This old route is now signed I-30 (Dallas-Fort Worth Turnpike), US 80 (former stretch between I-635 and Terrell) and Texas Spur 557 (bypass around Terrell). In 1977, I-20 was rerouted to go through the southern sections of Fort Worth, Arlington, Grand Prairie, Dallas, and Mesquite before rejoining its original route at Terrell. Part of I-20 in Dallas is named the Lyndon B. Johnson Freeway and used to be signed as I-635. I-20 continues eastward from Terrell, bypassing Tyler, Longview, and Marshall before crossing the Louisiana border near Waskom. In Louisiana, I-20 roughly parallels U.S. Route 80 through the northern part of the state. Entering the state from near Waskom, Texas, the highway immediately enters the Shreveport- Bossier City metropolitan area, intersecting I-49 near downtown Shreveport and passing close to Barksdale Air Force Base in Bossier City. From that area, the highway traverses mainly rural, hilly terrain, bypassing Minden, Ruston and Grambling before reaching Monroe. From Monroe, I-20 enters flatter terrain as it approaches the Mississippi River. Before crossing the Mississippi, the highway passes Tallulah. At the Mississippi River, I-20 leaves Louisiana and enters Vicksburg, Mississippi. A photo of the state welcome sign westbound. Upon entering Mississippi by crossing the Mississippi River, I-20 immediately enters Vicksburg. Between Edwards and Clinton, the highway mostly follows the original two-lane routing of US 80. In Jackson, I-20 sees a short concurrency with both I-55 and US 49. Also in Jackson is an unusually expansive stack interchange, at the junction of I-20, I-55 North and US 49 South. The interchange replaces a former directional interchange at I-55 North and a cloverleaf at Highway 49. From the Stack, I-20 continues eastward to Meridian, where it begins the nearly 160-mile (260 km) overlap with I-59. The route of the Mississippi section of I-20 is defined in Mississippi Code § 65-3-3. I-20 (co-signed with I-59) approaching I-65 in downtown Birmingham. This is sometimes referred to as Malfunction Junction. I-20 (along with I-59) crosses the Alabama state line near York, and it stays conjoined as it passes through western Alabama and Tuscaloosa. At Birmingham, the two highways pass through downtown together before splitting at Exit 130 just east of the Birmingham airport. I-20 continues eastward through Oxford/ Anniston, Alabama, and the Talladega National Forest, passing by the Talladega Superspeedway in the process, which is visible from the highway. I-20 enters Georgia near Tallapoosa and after passing through western Georgia, it enters the Atlanta metropolitan area. On clear days, eastbound motorists get their first view of downtown Atlanta as they come over the top of the Six Flags Hill. The Six Flags Over Georgia amusement park is easily visible off exit 46 eastbound. The highway then passes through the center of Atlanta, meeting with I-75 and I-85, which share a common expressway (the " Downtown Connector"). It continues through Metropolitan Atlanta eastward and through the eastern half of Georgia until it exits the state, crossing the Savannah River at Augusta. Throughout the state, I-20 is conjoined with unsigned State Route 402 (SR 402). Also, I-20 from the Alabama state line to I-285 in Atlanta is named the "Tom Murphy Freeway", but it is called the "Ralph David Abernathy Freeway" within I-285. The Interstate Highway is also named the Purple Heart Highway from I-285 in DeKalb County to US 441 in Madison, Georgia, and it is called the Carl Sanders Highway from US 441 to the South Carolina state line. Upon leaving Augusta, I-20 crosses the Savannah River and enters the Palmetto State and heads northeastward, bypassing Aiken and Lexington before reaching the state capital of Columbia, which can be reached most directly by taking I-26 east at Exit 64 ("Malfunction Junction"), then, almost immediately, I-126 / US 76. At Columbia, I-20 bypasses the city to the north and again turns northeastward, bypassing Fort Jackson and Camden. After crossing the Wateree River, it turns due east, passes by tiny Bishopville, before reaching the Florence area. It is near Florence where I-20 sees its eastern terminus at Interstate 95. However, for about two miles (3 km), the highway continues into Florence as Business Spur 20. I-20 in the Palmetto State is known as either the J. Strom Thurmond Freeway or John C. West Freeway. The first section to be completed was the bridge over the Savannah River in 1965; the last, the section between US 401 and I-95 (including the business spur), opened in August 1975. It was built in 1957 connecting Texas to the east coast running through Shreveport La, Ruston La, and Monroe La making it their first interstate. US 84 east of Roscoe. The highways travel concurrently to the Tye– Abilene city line. I‑820 / US 287 in Fort Worth. I-20/US 287 travels concurrently to Arlington. US 259 northeast of Kilgore. The highways travel concurrently to Longview. US 80 west-southwest of Jonesville. The highways travel concurrently to west of Waskom. US 71 in Shreveport. The highways travel concurrently to Bossier City. US 371 in Dixie Inn. The highways travel concurrently to Minden. US 80 in Delta. 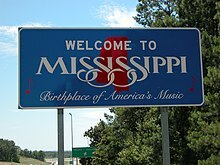 The highways travel concurrently to Clinton, Mississippi. US 61 in Vicksburg. The highways travel concurrently through Vicksburg. I‑220 / US 49 in Jackson. I-20/US 49 travels concurrently to Pearl. US 80 west-southwest of Meridian. The highways travel concurrently to Meridian. I‑59 in Meridian. The highways travel concurrently to Birmingham. US 11 in Meridian. The highways travel concurrently through Meridian. US 11 south of Lake View. The highways travel concurrently to Bessemer. US 78 northwest of Cooks Springs. The highways travel concurrently to Pell City. US 278 southeast of Lithonia. The highways travel concurrently to Covington. 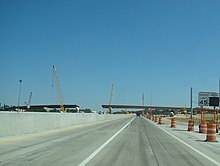 Two I-420s were planned, but never completed or built. One was to be a bypass around Monroe, Louisiana, but was never built. The other I-420 was planned as a bypass to the south of Downtown Atlanta. Due to anti-freeway sentiments, this I-420 was never completed, and the already-built portion has been signed as SR 154/SR 166, named Langford Parkway (formerly the Lakewood Freeway). ^ a b "Route Log and Finder List — Interstate System: Table 1". FHWA. Retrieved 2007-09-26. ^ Google (2008-02-15). "Overview map of I‑20" (Map). Google Maps. Google. Retrieved 2008-02-15. ^ "Interstate exit signs to get new numbers in Georgia". Jacksonville. Retrieved 17 January 2015. ^ a b Robert Malme. "Interstate 20 in North Carolina?". I-73/I-74 in North Carolina. Retrieved 2009-07-07. ^ "Strategic Highway Corridors". NCDOT. Retrieved 2009-07-07. ^ "Strategic Highway Corridors Vision Plan" (PDF). Strategic Highway Corridors. NCDOT. 2008-07-10. Retrieved 2009-07-07. ^ "Strategic Highway Corridors Vision Plan, Southeastern NC" (PDF). Strategic Highway Corridors. NCDOT. 2004-09-02. Retrieved 2009-07-07. 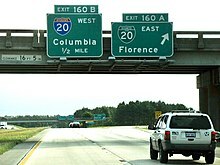 Wikimedia Commons has media related to Interstate 20.